Lightweight and compact one-piece design. Suitable for home theater, business meetings, exhibitions, conventions, presentions, etc. Portable：Material: Textile cloth！Practical and convenient，fold，lightweight，compact one-piece design，save space，easy to carry，you can fold the screen in a small size and put it in a backpack or suitcase. 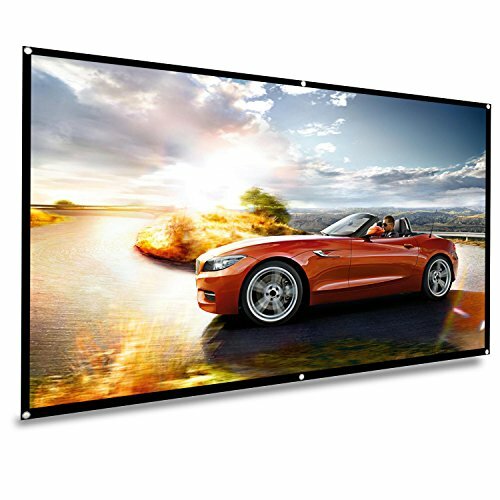 Format and size: 70 inches, 16:9 HD aspect ratio, the size is 6.9 feet wide and 4 feet high. Simple setup: There are 6 holes on the screen and 6 peel-off hooks for easy installation. Visual effect: Compatible with 3D DLP and LCD, support Double Sided Projection,the thin and clear material makes it easy to produce mysterious holographic phantom effects. Application scenario: Ideal for home theater movies, education, conference room presentations, public displays, outdoor movies. If you have any questions about this product by Koogoo, contact us by completing and submitting the form below. If you are looking for a specif part number, please include it with your message.